Product prices and availability are accurate as of 2019-04-15 04:51:03 EDT and are subject to change. Any price and availability information displayed on http://www.amazon.com/ at the time of purchase will apply to the purchase of this product. 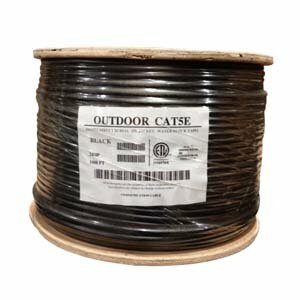 InstallerParts 1000Ft direct burial outdoor high performance Cat 5E data cable accommodates four unshielded twisted pairs of solid bare copper conductors of size 24 AWG and is enclosed by polypropylene insulation for flame resistance. It has a black sunlight resistant LLDPE jacket with moisture absorption water blocking tape for providing excellent performance. Cable can withstand temperatures ranging from -60 to 80 deg C and comes on 1000 ft reel. It has a jacket diameter of 0.2 Inch with a minimum bend radius of 0.8 Inch and offers maximum pulling tension of 25 lb. It has a voltage rating of 300 Volts and current rating of 1.4 Amps.